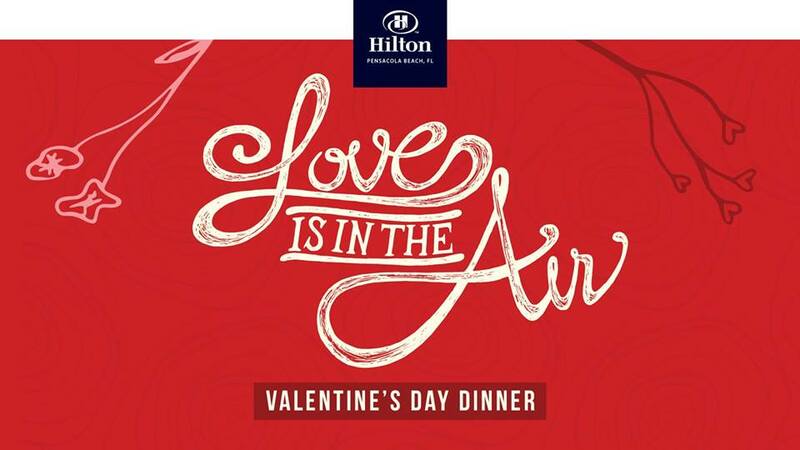 Treat your sweetheart to a romantic Valentine’s Day dinner at H2O Grill inside the Hilton on Pensacola Beach. This delectable three-course dinner features a wine pairing with each course, as well as a glass of champagne with dessert. We are excited to offer the following menu items this year. Seared scallop on basil-risotto round with balsamic & poached local shrimp on a tasso-polenta cake with roasted pepper cream sauce. Choice of white or red wine. 6oz. grilled filet with tempura shrimp, cheddar-chive potato croquette, starburst squash, wasabi cream & port thyme reduction. Choice of white or red wine. Cappuccino mousse cake with salted caramel sauce, served with a glass of champagne. Dinner is $55 per person. Please call 850-916-2999 today to make your reservation.